The Mobile Plutonium Facility (MPF) is the world’s only rapid response capability that can be deployed to characterize, stabilize and package plutonium for shipment to a recipient location. This stand-alone operating environment is completely self-sufficient. The MPF has a modular design that consists of air transportable International Standards Organization (ISO) containers that can be shipped to the target location. The ISO modules can then be assembled to execute a recovery mission within the country from which the materials are to be removed. The systems and equipment in the MPF support the safe characterization, stabilization, and packaging of plutonium materials. Most noteworthy, MPF can stabilize plutonium in forms expected to be found in the plutonium recovery and extraction process so that it is safe to ship and store for a sufficient time to allow for decisions to be made as to the ultimate disposition of the material. 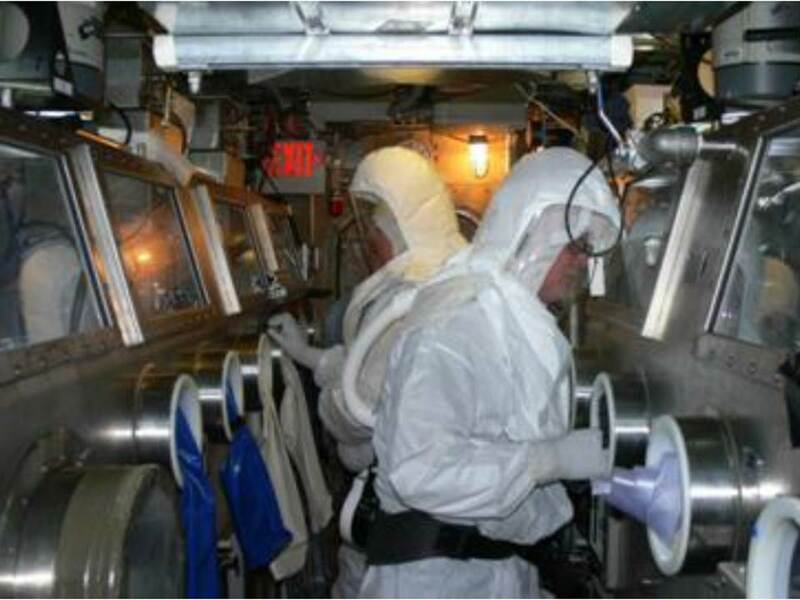 The MPF Rapid Response Team is the human component needed to verify, stabilize, package, and ship plutonium material and consists of approximately 25 primary personnel plus alternates on standby. The team’s role is to protect human health and safety, and expedite the removal of nuclear materials from a foreign location. Specific details of a particular mission, such as material properties, quantity, location, duration, destination, and disposition may not be completely known in advance. Hence, the capabilities of the RRT staff must be deep, broad, and flexible to deal with a wide range of possible situations. Mission durations could range from several weeks to several months. The premise is to identify capable volunteers who perform similar functions in their regular jobs at DOE sites and National Laboratories, provide them with tools adapted for use in a remote location, and train, support, and enable them. Doug Lowry is the Facility and Program Manager for the Mobile Plutonium Facility at the Savannah River National Laboratory (SRNL) located outside of Aiken SC. He received his bachelor of Architecture degree at the Boston Architectural College, Boston Massachusetts. After ten years in the public sector of architectural design Mr. Lowry moved to Evans GA where he accepted a position in the Engineering Department of SRNL, a Department of Energy organization. Over the past 24 years at SRNL Mr. Lowry has worked in Design Engineering, Project Management and Facility Operations management roles which include the past seven years building the MPF program for the NNSA, Office of Global Threat Reduction. He has been involved in nuclear material recovery programs in both Serbia and Sweden. Mr. Lowry is currently part of the Global Security Department at SRNL.